Over the years we have collected mosquitoes from within homes, many times. 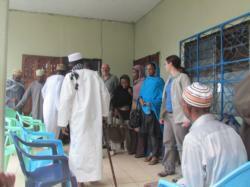 Permission to enter homes must first be obtained from the local chief and elders. Their permission after discussions almost always gives us full access to homes. Here we are preparing to discuss collecting mosquitoes at a village called Bouni on the island of Grande Comoros (Comoros archipelago). 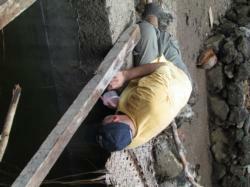 Gregory Lanzaro sampling Anopheles gambiae from within a concrete cistern next to a home in Bouni (Comores archipeligo). Cisterns represent a unique site for Anopheles gambiae to breed in which is probably an adaptation to exist in the Comoros where the standing water is scarce and rivers flow very fast because of the topography. One of our field workers fell in which took some doing to get them out because of the depth of the cistern and that she could not swim. 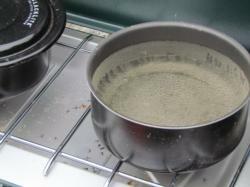 Mosquitoes were so abundant that cooking water without a lid became loaded with mosquitoes. 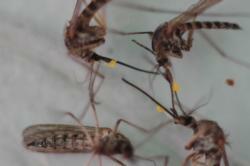 Note mosquitoes killed by heat from the gas cooker within a few minutes. June 2012. 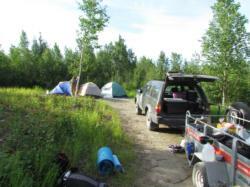 Campsite at arctic-circle post in Alaska. Thank goodness for a U Haul trailer because we had so much collecting gear with us. June 2012. 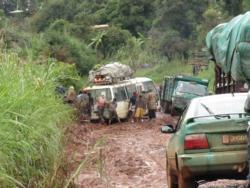 Typical pile up in Cameroon as we wait for hours for our turn to traverse through slippery muddy “highways”. Eventually we left Kumbo because we could not get anywhere because of the roads despite the fact that we still desperately needed to collect mosquitoes. 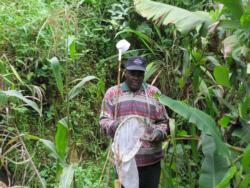 Salomon Patchoake, our primary field helper in Cameroon with whom we have been working since 2003. Here Salomon has a sweep net and larval cup to collect Anopheles, Culex and Aedes mosquitoes at Kumbo, Cameroon, September 2011. Typical site where Anopheles gambiae, the major human malaria vector breed. 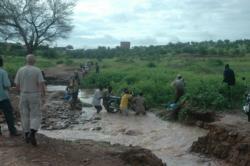 Photo taken near Baffousam, Cameroon, Sept 2011. 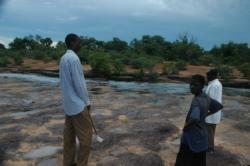 Abdrahamane (Abou) Fofana and Cheick Traore standing in the river bed of a river flowing through the village of Banambani, Mali in 2007. 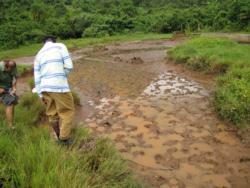 This is the site where Mario Coluzzi and Yeye Touré first collected mosquitoes representing the three An. gambiae chromosomal forms in the 1980’s. Abou and Cheick have worked with us in Mali since 2001. Abou regularly comes to the Davis to karyotype mosquitoes. Greg and I were hoping to get to the village of Seroume, West Mali, in 2008 but collapsed bridges and flooded roads prevented us from getting there. Joys of collecting!!. We thought of riding a donkey but it would have taken us six hours one way. 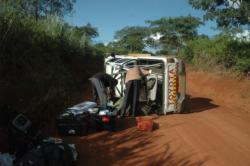 We had an accident in Cameroon. 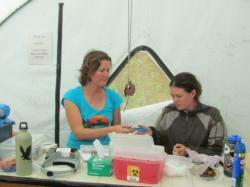 Fortunately I only broke my arm, but we were a day and a half from the nearest hospital.